President, Juan Carlos Varela inaugurated the Laudato conference at the headquarters of the Latin American Parliament (Parlatino), in Amador to discuss climate change and human trafficking on Monday January 21. The conference organized by the Ministry of Foreign Affairs and the Pontifical Academy of Sciences , in the context of World Youth Day (WYD) . President Varela stressed the importance of talking about Laudato in Panama, about the treatment of human beings, migrants, the fight against trafficking in human beings and how countries have the goal of achieving the Sustauinable Development Goals S (ODS) 2030. 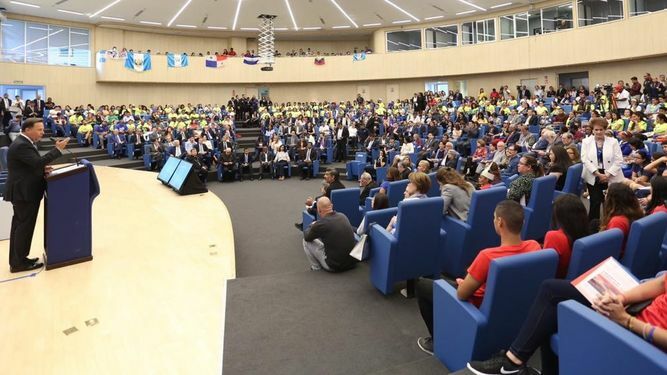 He recalled that Panama is a strong country, but one that depends on water and the protection of the environment for its economic and social development reports La Prensa. "Our Channel, from 2000 to 2030, will contribute nearly $40 billion to the Panamanian State, and it is the transparent, efficient use of these resources, which will allow Panama to reach the development objectives," he said. No public expenditures? A new University of Miami study has found a 400% increase in flooding in Miami Beach over the last decade and an acceleration in sea rise in the region faster than the global average. Big league public money is being used attempting to mitigate the rapidly growing problem. The old adage of follow the money still applies when it comes to global warming aka climate change. Certainly some money will have to be spent in the adaptation of how we live, how we build, how we grow our vegetables and fruits. For some it will mean total lifestyle change. The bottom line is, other than rising water levels if they occur none of these changes will require a great deal of public financing. To plan the expenditure of a 40 billion dollar budget based on little known information as to how the climate changes if any will affect Panama is ludicrous. The Panamanian Government certainly has far more important and critical survival problems. It the Government doesn't take care of its basic needs as mentioned above, education, poverty, infrastructure and the health system which includes the needs of the sick and elderly, many Panamanians will be going to heaven early. The biggest problem of all will be avoiding the scammers that are waiting for the climate change folly to begin in order to cash in on their share of the 40 billion. Follow the trail of Al Gore who went from a position of a retired former Vice President with a moderate income to a very wealthy individual simply by pushing the scam that is "man made climate change." What has he contributed to solving any problems. Nothing. This same government picked up street people, homeless persons, and supposedly drug addicts and bused them our of the city to the interior and to detention camps near Colon. These are some of the "migrants" that they didn't want the Pope to see while in Panama! $61 million for a Pope party, $40 billion for GW/Pontifical Academy of Science priorities. What's with all this end-of-term big government spending/financial commitments for ethereal/sacrificial projects when issues such as education, poverty, infrastructure shortfalls, the needs of the sick/elderly go unheeded. It almost seems that someone is using someone else's money to buy their way into heaven.